I don't have a problem with women's college sports in general (not a fan of women's college hoops, but to each his/her own) but I do have a problem with what ESPN is pulling tonight. The Phillies and Braves play tonight in the first official baseball game of the season in what is essentially opening night in Major League Baseball. At the same time, Louisville plays Oklahoma in the semi-finals of the Women's NCAA College Basketball Tournament. ESPN is airing the basketball game on regular ESPN and opening night on ESPN2. I really have a beef with this scheduling lineup. How can the women's tourney trump OPENING NIGHT and get preferred airing on ESPN? Now it doesn't really effect me at all since I (and most cables subscribers) have both networks but the principal of the whole thing bugs me. Baseball holds a long standing tradition in this country and the start of the baseball season should certainly be more celebrated than a SEMIFINAL game of the women's tournament. I'd be interested to see the ratings from tonight to see if more people really will watch ESPN over ESPN2. If the women's game draws more numbers than opening night then we really have changed as a nation when it comes to the culture of sports. Personally I think it's a disgrace to the game of baseball for ESPN to pass off the first game of the season to its backup network. Speaking of baseball, Josh had a great tee ball class today and really impressed the coaches with his brief opportunity to take his first hits off the tee. The coaches are pacing the class well, introducing a few key skills at a time. Last week was all about throwing and this week was basic hitting. In two weeks (no class on Easter) I expect them to learn how to run to first base after hitting the ball in fair territory. It's a great class because parents are allowed to help out. Josh was very excited to have class outside today on a real baseball diamond in the beautiful Spring weather. He really seems to enjoy playing baseball and I hope he continues to enjoy it and gets a chance to play some Little League down the road (something I wish I had done in my childhood). The highlight of the class today was when Josh used his expert arm and threw one of the balls back to the coach and hit him in the worst place for a guy to be hit. Thankfully for all involved it was just a plastic ball. 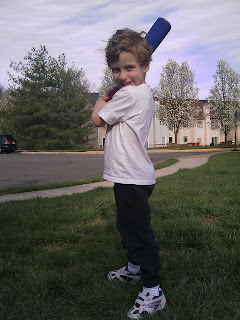 After nap-time today, the boys and I played out at the playground and played a little tee/wiffle ball. Alex got in on the action and took his first ever cuts at a tee (see video below). He had a good time running around after balls while Josh hit some monster shots with the wiffle ball. Needless to say, the Rose boys are all ready for baseball season. We were totally thinking the same thing last night!! I could not believe that Sunday night baseball was moved to ESPN2 in favor of womens college basketball.